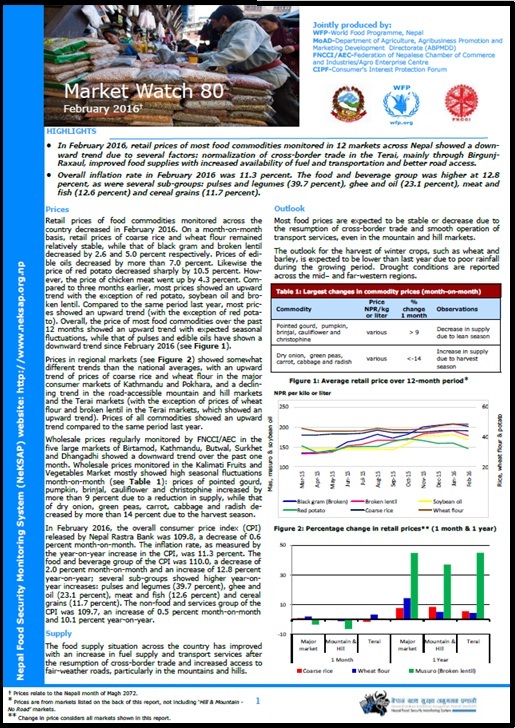 In August 2016, retail prices of most food commodities monitored in 12 markets across Nepal showed an upward trend due to the lean season of most cereal crops and limited access to roads, mainly in the hill and mountain districts. Overall inflation rate in August 2016 was 8.6 percent. The food and beverage group was 9.3 percent. Several food sub-groups were higher: sugar and sugar products (19.5 percent), pulses and legumes (18.7 percent), vegetables (17.9 percent) and fruit (12.6 percent). 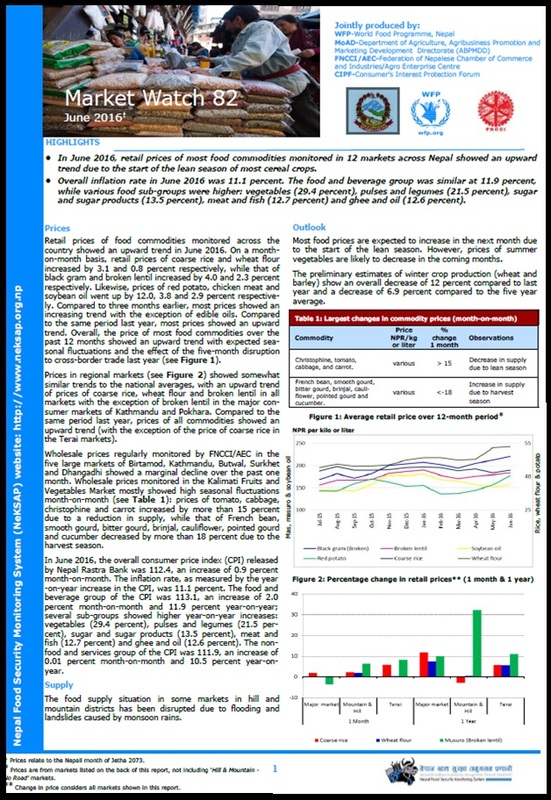 In June 2016, retail prices of most food commodities monitored in 12 markets across Nepal showed an upward trend due to the start of the lean season of most cereal crops. Overall inflation rate in June 2016 was 11.1 percent. The food and beverage group was similar at 11.9 percent, while various food sub-groups were higher: vegetables (29.4 percent), pulses and legumes (21.5 percent), sugar and sugar products (13.5 percent), meat and fish (12.7 percent) and ghee and oil (12.6 percent). In April 2016, retail prices of most food commodities monitored in 12 markets across Nepal showed an upward trend after a continuous fall in most food prices over the past three months. Overall inflation rate in April 2016 was 9.7 percent. The food and beverage group was similar, at 9.3 percent, as were two food sub-groups, milk products and eggs (9.8 percent) and vegetables (9.2 percent). Two other food sub-groups were significantly higher: pulses and legumes (26.8 percent) and ghee and oil (15.5 percent). 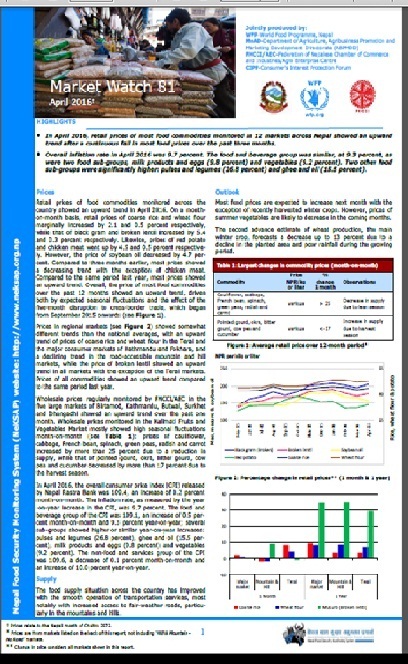 In February 2016, retail prices of most food commodities monitored in 12 markets across Nepal showed a downward trend due to several factors: normalization of cross-border trade in the Terai, mainly through Birgunj-Raxaul, improved food supplies with increased availability of fuel and transportation and better road access. Overall inflation rate in February 2016 was 11.3 percent. The food and beverage group was higher at 12.8 percent, as were several sub-groups: pulses and legumes (39.7 percent), ghee and oil (23.1 percent), meat and fish (12.6 percent) and cereal grains (11.7 percent). In December 2015, retail prices of most food commodities monitored in 12 markets across Nepal continued to rise. This is due to the disruptions to cross-border trade in the Terai, notably at the Birgunj-Raxual border point, which has limited the supply of essential goods, led to a shortage of fuel, and hindered transportation services. Overall inflation rate in December 2015 was 11.6 percent. The food and beverage group was higher at 14.8 percent, as were several sub-groups: legume varieties (48.9 percent), ghee and oil (42.3 percent), fruit (14.3 percent) and meat & fish (13.9 percent).